Cabo Blanco National Park, the largest natural reserve located in the Nicoya Peninsula. A wide variety of climates, and excellent geographical location, ranked among the most beautiful nature reserves in Costa Rica. It occupies a special place in the history of national parks of Costa. As the first protected area in the country, which was established in 1963. After about 2 km from the southern tip of the reserve is the island of Cabo Blanco. Since the time of the conquistadors who has been known as guano "Cape Blanco", because it covers the rocks embedded in the dry season. This sea bird sanctuary, off limits to visitors, is inhabited by large numbers of pelicans, frigate birds, laughing gulls, common terns and the larger community of Costa Rica from brown boobies. 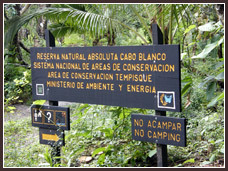 Cabo Blanco National Park This nature reserve covers 1172 hectares of humid tropical forest, over 100 trees have been identified. 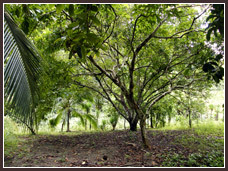 This lush forest is home to a variety animals, deer, armadillos, anteaters, monkeys, coyotes, porcupines and many more. Great variety of birds, magpies, long-tailed manakin, cattle egret, greedy, chachalaca, parakeets. Oncéanos Party belongs to the protected area of Cabo Blanco for marine life abundance.